We've all heard about Tunbridgeware. It's now associated with Tunbridge Wells, but it originated from wood turner George Wise's business in Tonbridge. His workshop was known to exist in 1746 on the banks of the Medway next to Big Bridge - it would have been somewhere between Pizza Express and The Wharf pub. the original buildings have been demolished. The site was probably chosen for easy river access and comprised of a workshop, showrooms and the family lived there too. 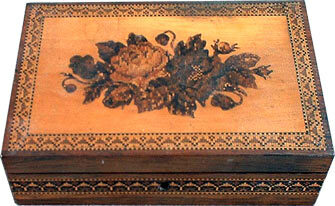 This small firm specialised in woodworking and eventually in the product we know today as Tunbridgeware. Tunbridge Wells museum hold a large collection. If you take a walk through Tonbridge School grounds you will find a sundial dedicated to George Wise. It's on the lawns by the chapel. Go take a look and also take in the interesting contemporary sculptures and architecture that the grounds have to offer. Remember to keep to the pathways. It really is a worthwhile and interesting walk. The sundial was spot on with the time!!! !